Cultivating Mushrooms at Home…Yes, it is possible! 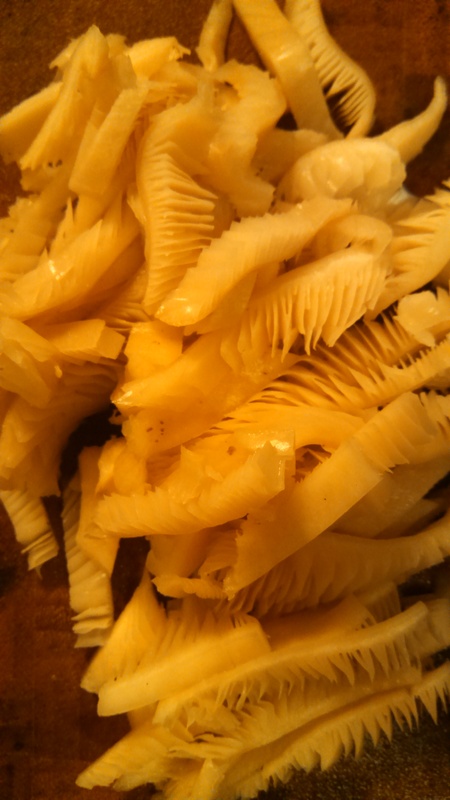 Oyster mushroom slices ready to saute for dinner! So yeah, we love mushrooms in this house! Almost as much as we love tomatoes! It only makes sense we start growing our own! I have done it in the past on a small level but now I want enough to share, barter, and sell to the chefs! My dad has a friend who propagates mushrooms in a lab and I have received the mushroom blocks like you get in kits from him. I grew them on my counter and they worked well but lets face it, I need more counter space for all my other projects! Growing the blocks is easy and fun but on a large-scale, I just don’t have the room. I got to plug a log and bring it home at a class years ago and it was fun. I put it in a shady spot and watered it well… at first… Then I got busy and didn’t water it all winter… In spring when we were cleaning up the yard I considered it a loss and just tossed it back by the compost pile and forgot about it. A year later there were mushrooms all over it! So I figure it has got to be easy if neglect created that many! So this time I’m going to really give it my all! We researched up and down what would be the best wood to use and got a good list together. Soft wood and conifers are not recommended for mushrooms. Certain species of mushrooms do best with certain tree species so do your research for what you are growing. We planned on getting some of the highest recommended wood possible. But then the universe stepped in and steered our decision… A huge pecan limb fell in a storm and was the perfect age to cut when we were feeling motivated to do this project so pecan is what we went with, good or bad… One thing we try to do is, use what we have on hand and not waste resources. So the most sustainable option for us at this time is to use the pecan. We cut the huge limb into 3 to 4 foot sections and used the ones that were 3 to 6 inch diameter. At this point it was a couple of weeks old which is a good aging period for the wood. You don’t want to use it too fresh or too old. A couple of weeks to a couple of months max. It has to still be holding some moisture inside so if it has been really dry you want it aged less. We charged the battery to our 18V drill and put our spare battery on to charge as well. A 5/16 drill bit is the right size for plugs to fit into. We used a Sharpie marker and drew a line on the bit at the one inch mark so we would go the right depth every time! 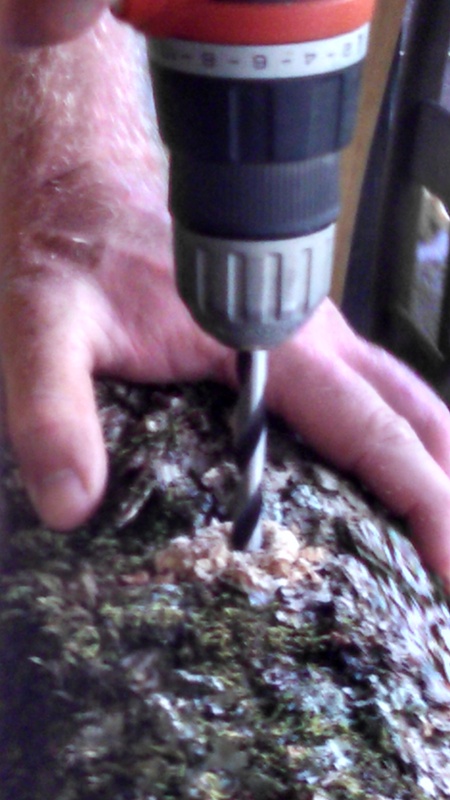 Starting 2 inches from the end of the log I began drilling holes. I alternated about 6 inches apart in rows approximately 2 1/2 inches apart. Enough space for mushroom clusters to grow big and strong. Ryan took over the drilling because pecan was harder than I expected, lol! We got 20-30 plugs per log. It is recommended to cover each plug with a thin layer of wax. We put them in a shady location in reach of the hose and watered them in well. We just stacked them up checker style and if it hasn’t rained we give them a good hose down! It’s important to keep hydrated! Our friend just contacted us about another bulk order and we will be doing more varieties in spring!!! Can’t wait for all the yummy mushrooms! Let us know if you are interested in ordering them in the future!